Do you recognise this tune? (The clip’s only a few seconds long, so it won’t take much time to listen to it). I’m sure most of you who like old Hindi film music will be able to guess this one. O P Nayyar’s favourite guitarist was a man named Hazara Singh, but occasionally, he’d let another guitarist play a piece. As in this case. The man who played the guitar here was my father’s cousin, Samuel Naseeruddin ‘Sammy’ Daula. 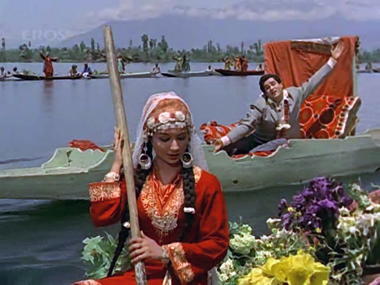 (Many of you might have recognised the song as Yeh chaand sa roshan chehra, from Kashmir ki Kali). Sammy Daula was my father’s first cousin—Papa’s father and Sammy Daula’s mother were brother and sister. While Sammy Daula was (as you can hear) a very talented musician, he didn’t take up residence in Bombay like my father’s brother Vernie did. Instead, Sammy Daula lived in Ludhiana, played there at concerts, and only occasionally swung by Bombay. On these infrequent visits to the heart of Hindi filmdom, he’d get some assignments—like this one. Unfortunately, even my father (who’s my usual source for family-related trivia) doesn’t know about any other songs for which Sammy Daula played. Yeh chand sa roshan chehra, in my opinion, is in itself enough to earn him a place in my lexicon of great musicians! While I’m on the topic of the Daulas, it’s worth sharing a small (and pretty funny) anecdote about Sammy Daula and his father. ‘Daula’ is actually a Persian title (as in ‘Siraj-ud-Daula’ or ‘Itmad-ud-Daula’) and was bestowed by the Mughals on only the very highest in the land. This implied that Sammy Daula’s family on the paternal side must have included some very illustrious, powerful and wealthy ancestors. By the time Sammy Daula was born, the Daulas had long converted from Islam to Christianity, but—as was often quite common among North Indian Christians—the names they gave their offspring continued to be a mix of ‘Muslim’ and more Western names. Which is why Alfred Moinuddin Daula named his son Samuel Naseeruddin Daula. Which would have been all very well, except that Partition happened, and Mr Daula (or Alfred Dada, as I referred to him) realised that it could be dangerous to live in an increasingly anti-Muslim area and have a name so Muslim. So he hurriedly changed his name to Alfred Mahadev Daula, and changed Sammy Uncle’s name to Samuel Narinder Daula—a covering of all bases? People wouldn’t know whether the man in question was Christian or Hindu or Muslim or just plain nutters. That, therefore, is another introduction to a little-known musician from the family. And, since this is a shortish post, I may as well devote some space to some hectic and shameless self-promotion. As some of you may already know, my third book has just been released. 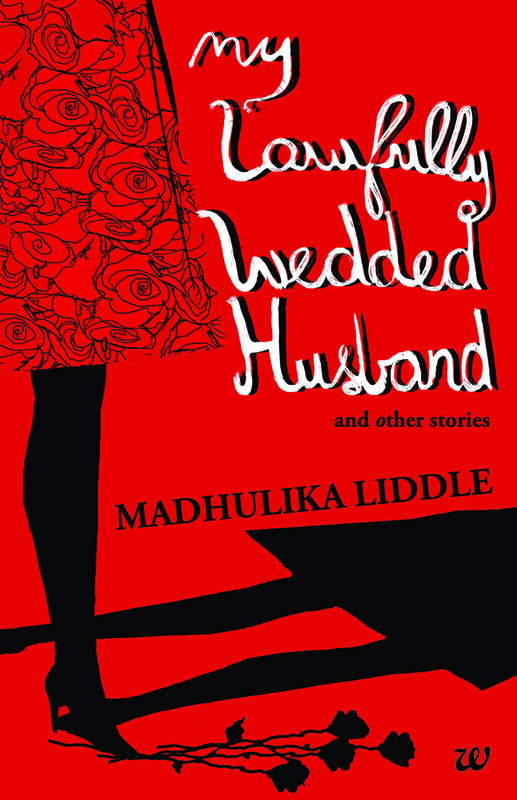 It’s called My Lawfully Wedded Husband and Other Stories, and is a collection of contemporary black humour short stories, stories always with a twist in the tale. The book will be available soon in all major bookstores, and can already be ordered online at Flipkart and Infibeam. If you like the way I write, give this a try! Edited to add: Since this post was written, I’ve discovered that two other films for which Sammy Daula played include Phir Wohi Dil Laaya Hoon, Tumsa Nahin Dekha, and China Town. Sammy Uncle’s widow, Aunty Caro, mentioned this to my father, but was unable to recall which songs he played for in these films. No matter; both, in my opinion, have great music! Further edited to add: One more song has been identified as featuring Sammy Daula’s guitar: Baar-baar dekho, from China Town. Another classic! The latest Muzaffar Jang book was due to have been released earlier, but the marketing plans are being put in place right now – so my other publisher ended up releasing this book first. Engraved in Stone (that’s the Muzaffar Jang book) will probably be released this month too. Oh, I totally ignored your father’s cousin! Sorry. :( The news about your book drove all other thoughts out of my head. And I haven’t slept all night, so I’m barely conscious. Never mind. The post isn’t going anywhere! You can always read about Sammy Daula when you’re more rested. Or in need of a laugh! Take care, and sleep well. Try chamomile tea, or hot milk, or a good hot foot soak. Or all. Okay, now that I managed to get some sleep, I read your post once again. :) You are right when you write that just the introductory piece to Chand sa roshan chehra is enough to put him into the hall of fame. :) Though I must wonder what he thought of it – from what you write, he doesn’t seem to have been very interested in ‘making it big’ in film music. I think it is safe to say that after the success of the film, he would have got other offers! I read Bawa’s anecdotes about him with great interest, and with a smile on my face. How nice it is to hear of someone you are related to, from someone else! Just love the way You write Always loved the way You wrote!!! Keep it up Madhu & I always Wish You Every Sucess in what You do! The cover simply says “BUY ME” but I’ll cheat. I will sneak in to Crossword, read the book and come back, slyly. Hope your publisher doesn’t see this comment. Peace. It’s so much simpler, honest and easier to buy the book rather than the embarrassment of getting caught. Also it’s unfair on the author for all the hard work she has put in. My suggestion : buy the book and read it in peace and enjoy. Isn’t there a difference between reading an entire book, and just flipping through a book to decide whether you want to buy it or not? Somehow, I think the latter is fine – fair on both the reader and the author. But reading an entire book in a store? If Crossword do allow that, it merely reinforces my existing opinion of them. Of course there is a difference, Madhu! But Crosswords was brought into existence by Ram (who began Landmark) who took the American bookstores like Borders and Barne & Noble as his ideal – they allow you to buy a coffee, sit and read – they have some excellent chairs to do so. Of course, their gamble is that someone who sits and reads in the store will actually buy a couple of books before he/she strolls out. I much prefer Strand in Bombay or Premier in Bangalore, or a tiny little bookstore in Delhi that my friends took me to – with books piled up all over the place, staff who actually read something other than the immediate bestsellers, and who can recommend books and authors you may be interested in but have never heard of until then, etc. I wonder which bookstore that was your friends took you to in Delhi? One like that is called ‘Fact and Fiction’ – it’s in Vasant Vihar’s Basant Lok market, and is the sort of place where the owner really knows his books. More than a touch of literary snobbery there, but still. Try Kindle? My sister has switched to that ever since she realised the number of books in their house would probably soon mean either they lived in the house, or their books did! This drinking of coffee while browsing books seems to be carried over from earlier times in Europe when writers and musicians met in cafès to ‘discuss’ and ‘talk about’. …but read a whole book? Who does that? We too have lots of bookstores with cosy cafés inside to sit and enjoy coffee while you browse through books, but I don’t think etiquette allows one to read it through. But that is part of culture I guess. Here shops leave things lying outside overnight expecting people to not pick them and walk away, but to buy them when the shop opens the next morning – things like bottles of drinks, fertilizer for the garden, small plants. Even tickets for buses and trains are on a ‘trust’ basis. Apart from surprise checks no one sees whether you have one. pacifist, I really don’t know who does that. I know I don’t, simply because if I find a book engrossing enough that I want to sit and read it, then I buy it. :( I suppose if people did want to do something like that, they would. Much like the ones who will travel ticketless because ‘no one checks anyway’. I’m not defending reading a book in a bookstore instead of buying it. (The only place I would do that is in a library where the notion is that you read and return a book. But even there, I find it much easier to check the book out and return home where I can read in much more comfort.) I’m just saying the attitude is not only prevalent, but quite widespread that since ‘everyone does it’ it is quite okay. Anu, the ‘who does that’ wasn’t a question :-) it just meant one is not supposed to do it. Perhaps this is done in US and now India, but I haven’t heard of it here, that’s why the surprise. In fact I’m sure it will be frowned upon if someone sits for hours with a book. A cup or two of coffee is the decent length of time one would be expected to spend. I’m curious though. Do they then sell this particular copy which has been handled for long. Doesn’t it look used? Would anyone buy it? I know, rhetorical question. I figured that out after I wrote my vishesh tippanion the subject. Yes, you’re right that you are expected only to be spending the time you would spend over a coffee, but I have seen people who look like they are set for the day! But I think bookstores tend to accept that some books will be used/read/otherwise unsaleable; it becomes part of their overhead. I’m assuming that such books will a) be sold as part of their ‘sale’ (you get some excellent books cheap that way) or b) sent back to the publisher to destroy. a) I don’t think your post was ‘shameless self-promotion’! As I said above, if you can’t talk about your book on your blog, then where are you going to talk about it? b) I, for one, am glad you told us about it. I’m sure others agree! The publisher may not see it, but I have. Thank you for letting me know that I can kiss some of my royalties goodbye. Another illustrious member of the great family Liddle! I wonder at times, how come you became such a good writer! From your genes,y ou should have become a musician! Madhu, I can see you sitting with a sitar or a veena and strumming away to glory. But good that you became an author of good books, this way I can enjoy your art everywhere! This was an interesting story about your uncle. I think his children are also not a big help in finding out about the songs he accompanied with his guitar. Makes me feel sad about the world in which we live, where people have to afraid of their identity! Looking forward to enjoying your book! Heh. Yes, I guess with genes like that, I should probably have ended up being a musician, no? But then, neither of my parents plays any musical instruments – and both read a lot. So, growing up surrounded by books, it seems not that surprising that I became a writer! Unfortunately, Sammy Daula passed quite a few years back (maybe about 20? I don’t remember), and even his son – who was also a guitarist – died some years ago. I don’t know if his daughters (whom, unfortunately, I’m not in touch with) would know. But, as I mentioned, Sammy Daula didn’t play very regularly in Hindi cinema, so it may even be that there aren’t that many songs to his credit. Oh DO, who wouldn’t know that short piece of guitar music. It’s the most outstanding part in the whole song. I hope you’ll come across/discover some more guitar pieces by your uncle. BTW the design on the cover is very good. I like it. Thanks so much, Pacifist! I’ll let you know when the book is available in bookstores and outside India – it should be fairly soon, I suppose, since my publishers are planning to put it on Amazon, and release a Kindle version as well. >Now I’m curious about the ‘personal family history on about the same lines’ you mention! Incidentally, Sammy Daula’s father forgot to tell his own wife that he had changed his name – she only discovered when one day the postman delivered a letter addressed to ‘Alfred Mahadev Daula’! And, considering Sammy Daula’s film connection, apt too. Yes, somehow ‘Jaani‘ always brings to my mind Raj Kumar. Madhu, he was our music teacher in school forever and ever! Oh, I can’t believe he was related to you!!!!! You can probably share more anecdotes about Sammy Daula than I can! Haha, his house was a short walk from the school, if I remember correctly, in Sarabha Nagar. He always dressed really elegantly, and wore perfume (or an after-shave with one) which made him stick out a mile as he was the only teacher to do so. He was there for many many years. Of course, we usually heard him play the piano: he made 35 of us play the guitar – poor man, why did the nuns put him to teach music to entire classes at a time! And we were the smallest class. He usually accompanied us on the piano and tried to make sure we at least, sort of, kept together while struggling to play simple Hindi songs. He played the music for the nicest dance I had one of the “leads” in, to the Tamil version of “Panchhi banun udti phiron…”. First time they used live music and singing (an enthusiastic new teacher from South India, who loved dancing organised it). He accompanied me once when I decided to sing “Living next door to Alice”; I am sure the poor man tried to dissuade me, but I was determined, and he tried to keep the piano to my singing which must have been all over the place. Thanks so much for sharing your memories of Sammy Daula. I do remember him as being always very smartly-dressed, his hair always neatly slicked back, and yes – smelling good too! I don’t recall ever having heard him play the piano, though I do have recollections of him strumming on the guitar on the very few occasions when we visited his home in Ludhiana. Madhu, found this in The Tribune, dated 16th May, 2001. Ah, yes. He died tragically young. I only remember him as being a gangly teenager who was as passionately fond of music as his father. Proud to b a grand daughter.. Hello!! :-) Lovely to ‘meet’ you here. Thank you for commenting! And if your buas remember any other songs your dada might have played for, do share. This short post was interesting and so were the comments particularly the ones by bawa. As usual memories stirred up. 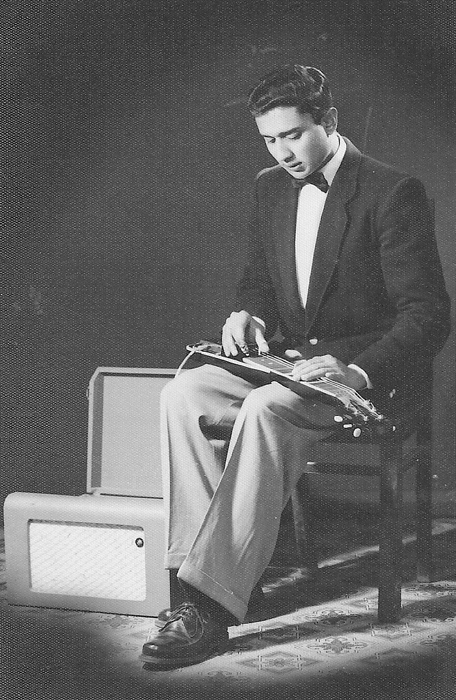 I grew up watching Hazara Singh playing the guiter in many a live show. He was very famous then and quite a respected musician. I can always depend on you to contribute a personal perspective to discussions on old Hindi cinema, Shilpi! Thank you for that tidbit about Hazara Singh – I hadn’t heard of him until my father mentioned him, about a year ago. I can imagine, of course, that if he was O P Nayyar’s choice of guitarist, he must have been pretty well-respected. If I have said earlier that you have done a great job and a greater service to HFM, by inroducing ‘those’ backend ‘unsung’ masters. I would ‘shamelessly’ repeat it. The sweetness will ciulminate to its peak, when I get to lay my hands to read it.!!! Gosh Dustedoff, you have all these family connections to film people! Films do follow you around a lot. (Now if they followed me…) And I’m never gonna look at “Yeh Chand Sa Roshan Chehra” the same way again! And you got a YouTube account, heehee. I subscribed to you. Coincidentally, my gmail account that I made recently is msbombaynoir@gmail.com. Heh. Yes, Clark Gable in It Happened One Night does remind me a bit of RK (especially in Chori Chori) and Guru Dutt (especially in Mr & Mrs 55), a bit. Yeah. Love his rougishness too! The walls of Jericho! Haha! I saw that you had written to me on my contact form. Will reply to you separately on that.